April | 2012 | Goin' Mobile - Adventures of a Travelin' Music Junkie! **I’ve always envied those artists, writers, poets of the past who followed their passion by living in foreign countries to focus on their art. Van Gogh, Capote, Hemingway and many others didn’t let reality stifle their dreams – they simply went for it. Sometimes I would visualize myself in a villa in the south of France writing a book, or painting while overlooking the clear blue waters of the Mediterranean Sea. Then I would snap out of it and think to myself: In your next life, baby! Then, it suddenly dawned on me, that where I am at in my life right now, I could possibly consider doing something similar, in a simplified, lower-class version. For years I’ve dreamed about traveling to festivals that I’ve heard about through the musical grapevine. (I’ll never get over the fact that I missed Woodstock, even though I was too young and too far away to accomplish that feat.) Austin City Limits, The New Orleans Jazz Fest, South By Southwest, the Blues Cruise, etc, were all nice sounding events that seemed out of reach to me. However, because of a series of fortunate (and some not so fortunate) events, these far off thoughts barged themselves into the forefront of my mind. Maybe I could do it!! So, here I sit in my hotel room in the French Quarter of New Orleans, ready to bounce to the Jazz Fest today. (http://www.nojazzfest.com/) I arrived last night and, of course, ventured over to Bourbon Street, popping into Le Bayou Restaurant (http://www.lebayourestaurant.com/) for some spicy Cajun shrimp and a lovely Voodoo Juice cocktail. The streets were bustling, as always in this town, but my guess is the ‘best’ is yet to come! Beginning today, I’m sure the masses will flood into NOLA and overpopulate the French Quarter and the Fair Grounds Race Course, where the party begins! Tonight’s featured bands are The Beach Boys (50th Anniversary Tour,) Bon Iver, Buckwheat Zydeco, to name a few. 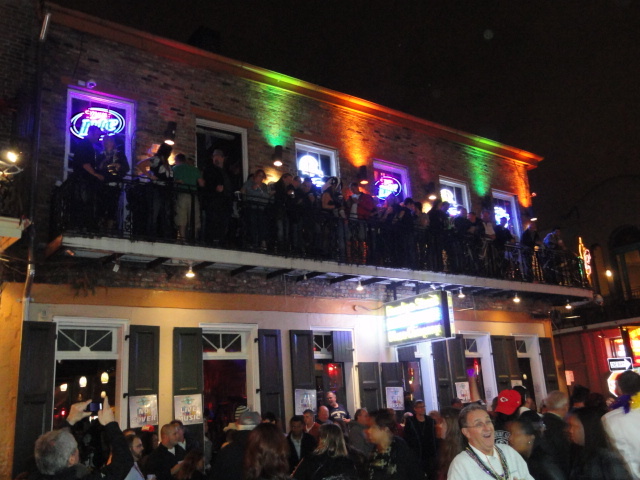 The music starts just after 11:00 am and plays all day and into the earlier evening hours, probably so that everyone can boogie over to Bourbon St. and continue the partying and patronizing. ***Usually, while in a foreign country, I seek out the local vibe. Most recently, I had the delightful fortune of visiting the gorgeous and friendly country of Ireland! Talk about a musically inclined country!! What a pleasant surprise for me to be inundated by local Irish folk music at nearly every pub, on every block, on every street, in every town I visited! And, I thought I was just going to party it down with the local Irish lads and lasses in this country known for it’s whiskey, pubs, and the Jameson and Guinness factories! Ha! Little did I know that this country’s music would entice me and I’d come home with two new (and never previously heard) favorite songs – Whiskey in a Jar, and Dirty Town. Everywhere you go in Ireland, you will hear these two (and many, many others) performed by all types of musicians. Two of my favorite spots for music were at the Danny Mann Lounge (http://www.evistonhouse.com/dynamicPage.asp?id=16) in Kilarney, where my traveling partner and I enjoyed dinner and a show by a two-man duo – guitar and fiddle. These two guys put on such a mesmerizing performance, that the next morning at breakfast in our hotel, I jumped into an immediate conversation with Mr. Fiddle, when I noticed him eating at the table next to ours. I tend not to be one to intrude, impose, or interrupt, but when I’m in an audience watching a performance, for some reason I feel that the band and I are automatically friends! Most of the time, the musicians are very receptive and thankful that I enjoyed their performance so much, as was this very gracious fiddler. Of course, there have been those times when they think I’m a complete off-her-rocker lunatic, but those are pretty few and far between. Thank goodness, because in reality, I’m just an excitable music appreciator with purely innocent intentions. Well, as long as I know that, then no one gets hurt! 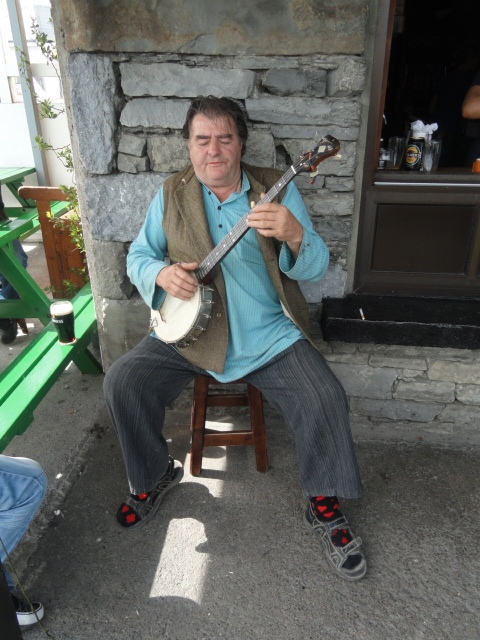 My other favorite musical experience while in Ireland took place in a cute, little village known for its music – Doolin. 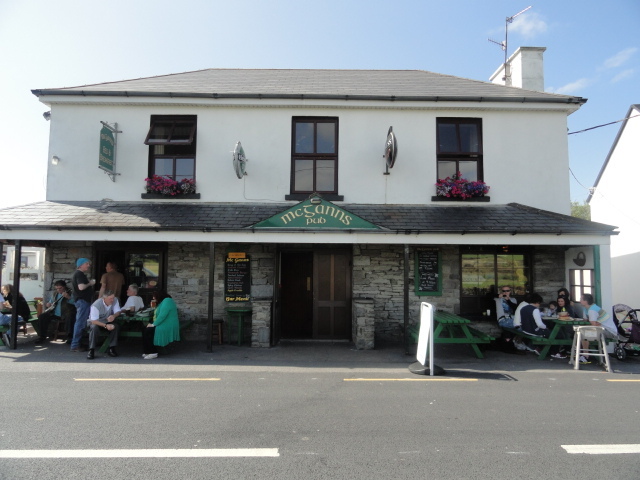 My cohort and I, stopped here for a drink and bite to eat after a day of driving and sightseeing, a la Rick Steves, (http://www.ricksteves.com/plan/destinations/ireland/ire_menu.htm) who recommended McGann’s Pub in his book on Ireland, and it didn’t disappoint. Outside this quaint place, along with a few picnic tables, was a local musician strumming his banjo and serenading we patrons. He was an authentic old Irishman whose heart was saturated in a lifelong love of his roots, culture, music and all. He sat minding his own business playing one old Irish folk song after another, whether anyone was listening or not. Some local beer drinking young’uns occassoinally requested one of their favorites and sang along, all the while Cohort and I soaked up the experience, as well as some rare Irish sun. It was a very relaxing and pleasant break from the drive, which by no means was boring or uninteresting. If ever you get the chance to visit Ireland, a drive up the west coast of this breathtakingly beautiful country is well worth it. The scenery – ocean, cliffs, rolling green hills – are stunning, especially on a sunny day! 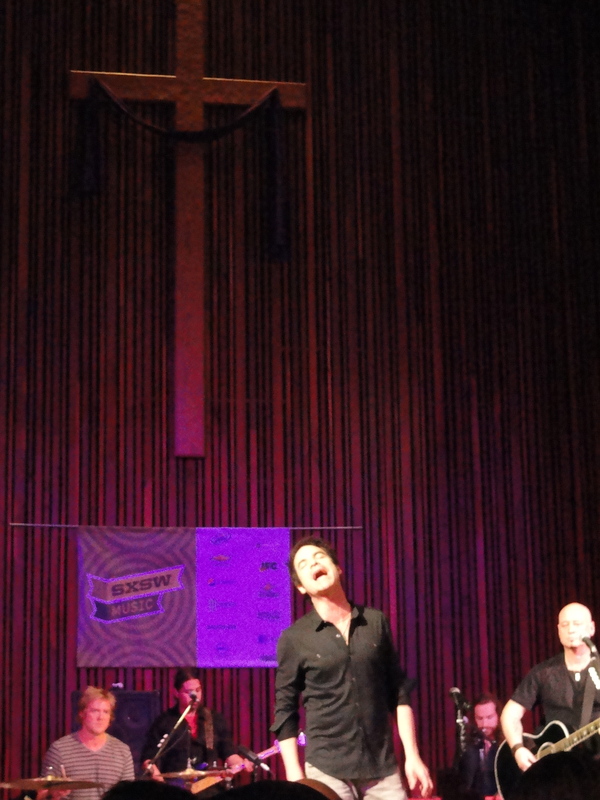 ***The time came to hoof it on over to Central Presbyterian Church to make sure I got a good seat for Train. I admit, I thought the venue was a bit strange for a rock band, but I had read the reviews for Fiona and they raved over the acoustics. So, it made sense to me, plus churches are old, and they were all about the choirs and singing, and most were probably built before there was decent, if any, amplification. So, I high-tailed my tail to church and got a very nice seat in a pew about six rows back from Jesus. Having been so hell-bent (oops, I’m in church) on seeing Train, I never bothered to notice the rest of the schedule for this venue tonight. But, man oh man, did I have a delightful surprise. A band from Los Angeles – A Fine Frenzy (http://www.myspace.com/afinefrenzy) – had just begun to set up as I was getting myself situated. They were a cute bunch, three guys and two girls, and when they started playing and Alison Sudol started singing, I knew why we were in a church. This girl, blonde, sweet, and angelic, had the voice of an angel! The closest I’ve ever heard to a voice like hers, is when the Celtic Women sing. Wearing a red-orange dress, with a crisp, pristine voice, not only was it hard to take my eyes off Alison and her crew, but she almost put me into a trance. He voice was almost other-worldly, heavenly, ethereal, and she had the look to match. The music this band delivered was folksy and New Agey, but are considered an Alternative, Indie band. They delivered their sound with talent, moving between the keyboard, guitars, drums, while Alison kept the audience entranced as frontman. I was very impressed, and mesmerized by this band, and must say that a church was the perfect backdrop for their angelic sound. It was all over way too soon! Since these shows are short showcases, and/or condensed concerts, they go by fast! You get a good taste for the band, but nothing near a complete concert. This works at South By because you can never really OD on music since it is over at the height of the excitement. You’d think this would be frustrating, but there’s no time for frustration in a town where there is more music and bands to possibly see them all. If you like music, it’s like being a kid in a candy shop. To sum up my first experience at South By Southwest, I would say it was fantastically wonderful time! Austin is buzzing with so much creativity, abundant talent, bursting with music, and overflowing with people during this festival. It’s a music lover’s Disneyland!! If music rocks your world, like it does mine, it would be impossible to have a bad time at SXSW. But, go with an open mind. Don’t expect to be able to see or experience everything. Be prepared, do your homework in advance, and have a plan. There’s no time to waste in Austin, because there are so many places to be, see, and do. My little saying of “So much music, so little time!” couldn’t be truer than at South By Southwest! It was a little challenging at times chasing down my entertainment of choice, but it was sure fun trying! ***After the last panel, I was itching to get over to 6th Street, to find a pot o’ gold and leprechauns – or some corned beer and green beer! Being that it was a Saturday, to add to party fever mode, the crowd out on the street was ridiculous! The action started early so I paced myself. Strolling by the ‘Chuggin’ Monkey,’ I was pulled in by the man at the door (who ended up being the dad of one of the kids in the band) and ended up really happy about that. ‘The Neckties’ (all of about 14-15 years old) hooked me instantly! They had a 1970s rock style to them, the lead singer reminding me of a young Mick Jagger/Steven Tyler/Robert Plant; and the guitarist having a Jimmy Page/Joe Perry/Keith Richards style to his playing. This was not at all what I expected out of a band of kids! With all the Death/Heavy Metal, Rap and Hip-Hop influences for youngsters these days, hearing and seeing this talented bunch perform a sound that spawned from my era, was music to my ears! In the middle of one particular song, there was a power outage, but they didn’t miss a beat. They pushed through it calmly and the singer continued on without his mic. It was very impressive! I am a new fan of these boys, plan on following them (quickly ‘Liked’ them on Facebook,) and hope to see them again, cuz I’m betting they’ll be well known some day! 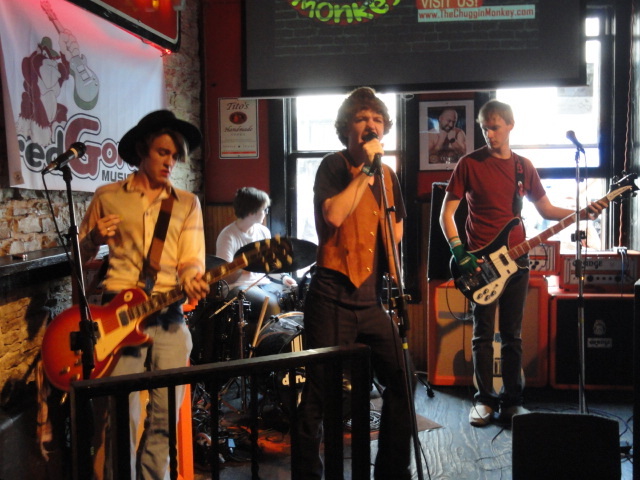 Watch out SXSW….the Neckties (https://www.facebook.com/TheNeckties) will no doubt be back to make a BIG name for themselves! Over at ‘Friends Bar’ was a local classic rock band, the’ Rachel Crawford Band,’ which was the perfect band to enjoy a St. Paddy’s Day green beer to. Rachel is a very cool, soulful singer with all the right moves. For a few songs, she invited Japanese musician, Motoi Konno, to join the band on stage, which was a kick. Music transcends everything and unites everyone! In search of an Irish bar (it was St. Patrick’s Day, after all!) I found ‘BD Riley’s’ with stick-to-your-ribs food and a healthy dose of Irish music. After getting my fill of corned beef, cabbage, and mashed potatoes-YUM!-I needed to get back to my SXSW experience, since after all, it was the last night of the festival….and, I had my evening schedule planned. Rumor had it that Stubb’s BBQ (http://stubbsaustin.com/about-stubbs) was the place to be tonight. I summed this up by talking to others and doing my research over the past few days. Many names stood out, and two were playing back to back at Stubb’s tonight – Michael Kiwanuka, Justin Townes Earle – before the piece de resistance (for me, at least) TRAIN, who would be playing at the Central Presbyterian Church on 8th. But, no one seemed to know about it. Like I said, everything is kept under the radar, plus there are so many bands to see and places to go, that people are spread out everywhere! And, you’d need to clone yourself to get to even 1/10th of the performances! I arrived everywhere early on this night, so as not to have a repeat performance of my Fiona Apple night. 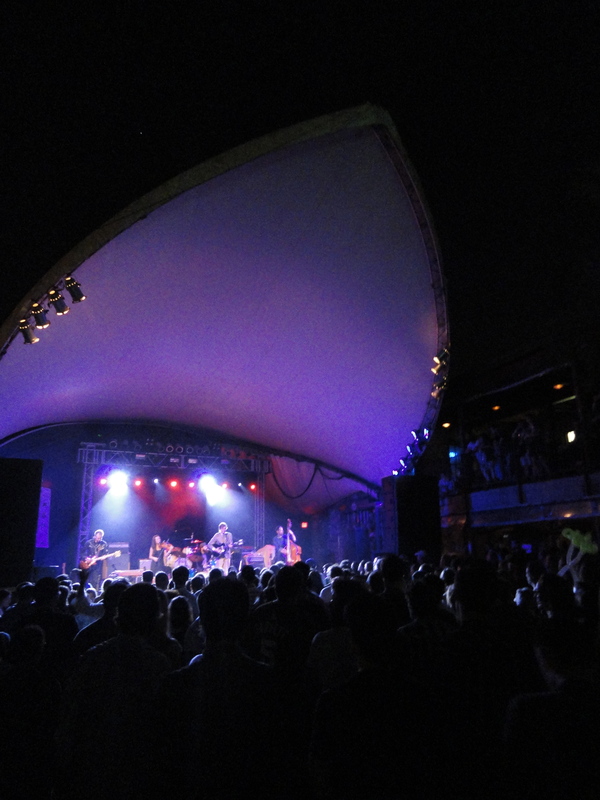 Stubb’s has an excellent outdoor area with a big stage, outdoor bars, and a good ol’ down home concert experience – real music and pure talent. Both bands were thoroughly entertaining, yet completely different from each other. Michael Kiwanuka has a bit of a rootsy, country sound, with a lot of soul. (http://michaelkiwanuka.com) Influenced by Otis Redding and Sly Stone, he was also very inspired by the movie about the Band’s ‘Last Waltz’ farewell concert and through it all, came up with his own sound and style. Justin Townes Earle and his band (http://www.justintownesearle.com) have more of an Americana, bluegrass, Buddy Holly blend (if that’s even possible) and Justin has the look to match. He resembles the most straight-laced nerd you have ever bullied, but according to his bio, was quite the bad boy when he was younger. (He’s all of 30 years old now) and has already been a pretty serious drug addict, arrested for battery, public drunkenness, resisting arrest, and gone through rehab. Once he kicked drugs, he began focussing intensely on his music, and in September 2009, he received an Americana Music Award for ‘Emerging Artist of the Year.’ He’s come a long way in a short time! 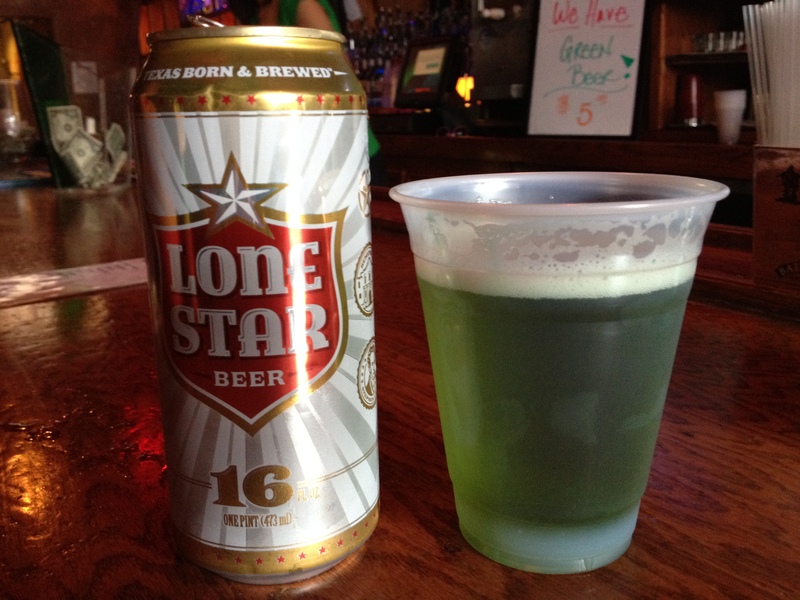 ***Saturday just happened to be the last day of SXSW AND St. Patrick’s Day!!! What a party! I was wondering how, or if, I was going to juggle the two when I overheard someone say, “To do South By or St. Patrick’s today, that is the question?” So, I wasn’t the only one…. It may not sound like a difficult decision, or even a decision at all, but it is. When you have well-known bands/singers, and the whole SXSW festival showcasing specific acts in certain chosen venues, side by side with Spring Break on Crazy 6th Street, AND St. Paddy’s Day….all rolled into one day, watch out!! So, I was a smart girl and mixed it all up. I hit the panels in the morning – today’s agenda was ‘Cosmic Cowboys & Redneck Rockers: The 40-year Reunion’ and ‘New Atlantis: New Orleans Music Rebuilds.’ Then after that the plan was to boogie on down to 6thto see what the mid-day festivities brought. 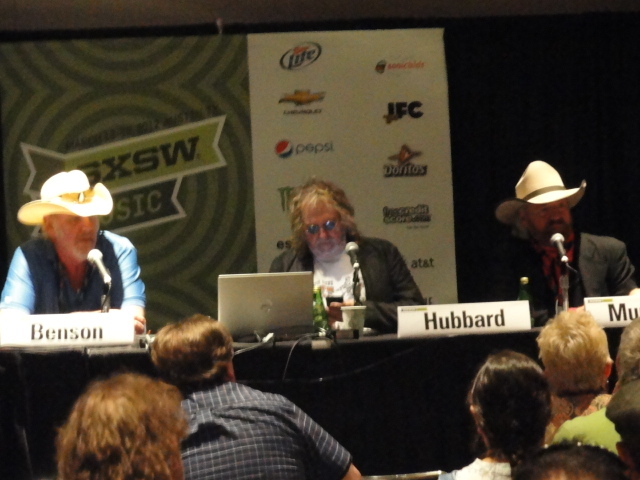 The reason I chose to see the ‘Cosmic Cowboys’ panel was because I’m really into Country Western music these days, they had a cool sounding name, and I guess they were sumthin’ back in their day. Unfortunately, I missed half of it, thanks to my shuttle deciding to be an hour late this morning! The very same shuttle that I was ranting and raving about the previous few days because of their willingness to pick me up whenever they saw me walking around….and not just at the scheduled spots. Oh well, can’t win ‘em all, I suppose. I walked into the discussion when the Rednecks were talking about Willie Nelson, and how he started the fusing of country music with rock & roll. It was the early 1970s, and Willie started off his career with short hair and wearing suits, but after playing all the honky-tonks in Texas, he grew his hair, dressed like a hippie and changed the country music landscape for good. His audiences were filled with rockers, country music lovers, and even the ‘good old boys’ and he was accepted by them all – a Pied Piper. This group also mentioned something that surprised, and disappointed me – that today’s country music is being focused on the 35 year old suburban housewife! Ugh, that was so upsetting to me, because here I have been so moved by the amount of emotion and lyrical tenderness in the songs being sung by the biggest studs ever – the All-American Cowboy! I’ve been so impressed that these macho, salt-of-the-earth, rugged guys can show a soft side that women love! To hear this little fact got my cynical mind reeling that this is all a ploy to get the country music loving women all mushy and gushy so they’ll fall in love with the singers, their songs, and buy their music. And of course, the guys in this age bracket become fans, too, in order to learn what women want. Just treat her like these songs suggest, and – BAM! – you’ve got her, hook, line and sinker! Well, now that I’ve put this into words, maybe that’s not such a bad thing, after all. If it helps men understand (and treat) women a little better, then that’s a positive thing, for sure! The New Orleans Atlantis panel was a bit disappointing, seeming to be more of a self-promoting event than anything else. Maybe it was over my head, another language so to speak, or I just wasn’t aware of what I got myself in to, but I found myself pretty lost in this meeting. 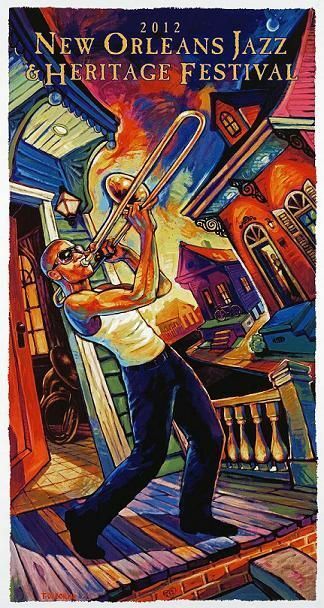 But, what did sink in was the mention that, after Hurricane Katrina disaster, which these people call ‘The Federal Flood,’ the music became magic, bringing the people together, and resulting in a different kind of pride for the city. They went on to discuss the many various forms and styles of music there is in New Orleans, even though it is known at the birthplace for jazz. They spoke of the large hip-hop scene, bounce, Second Line, brass bands, and Mardi Gras Indians, none of which I had ever really heard of. Many of the panel was tied together by the HBO series, ‘Treme,’ (http://www.hbo.com/treme/about/index.html) which tells of one community’s struggle to rebuild and reorganize in the aftermath of Hurricane Katrina. Three of the panelists were related – Don Bartholomew (son of the legendary songwriter and producer of New Orleans artists, such as Fats Domino, Shirley & Lee, and Lloyd Price,) and his two sons, Supa Dezzy and Chris Magee. It was interesting ot hear viewpoints from so many different generations here, and to know that music in New Orleans may be changing, but the jazz roots are infiltrating and being borrowed by the younger set and is being incorporated into their music, causing a whole new sound in this city. I love New Orleans, but am more interested in going back in time…I mean, real far back into more historically rich musical times. But, that’s okay….we gotta change with the times….and in reality, it’s ALL a part of history!! !